Production: Réalisations d'Art Cinématographique (R.A.C. ); black and white, 35mm; running time: 117 minutes; length: 10,530 feet. Released 4 June 1937, Paris. Re-released 1946 with much footage deleted, re-released in 1959 with most original footage restored, and again in 1972. Filmed from about 30 January-2 April 1937 in Billancourt Studios, Tobis Studios, and Eclair Studios, Epinay; and on location near Neuf-Brisach, the Colmar barracks, and Haut-Koenigsbourg, Alsace. Producers: Frank Rollmer and Albert Pinkovitch; screenplay: Charles Spaak and Jean Renoir; assistant director: Jacques Becker; photography: Christian Matras (1st operator) and Claude Renoir (2nd operator); editor: Marguerite Marthe-Huguet; sound engineer: Joseph de Bretagne; production designer: Eugène Lourié; music: Joseph Kosma; lyrics: Vincent Tully and A. Valsien; costume designer: Decrais; technical advisor: Carl Koch. Cast: Erich von Stroheim ( von Rauffenstein ); Jean Gabin ( Maréchal ); Pierre Fresnay ( de Bœildieu ); Marcel Dalio ( Rosenthal ); Julien Carette ( Actor ); Gaston Modot ( Engineer ); Jean Daste ( Teacher ); Georges Peclet ( French soldier ); Jacques Becker ( English officer ); Sylvain Itkine ( Demolder ); Dita Parlo ( Elsa ); Werner Florian; Michel Salina; Carl Koch. Awards: Venice Film Festival, Best Artistic Ensemble, 1937; New York Film Critics' Award, Best Foreign Film, 1938. Spaak, Charles, and Jean Renoir, La grande illusion , London, 1968; Paris, 1971. Spaak, Charles, and Jean Renoir, Velikaja illjuzija , in Iskusstvo Kino (Moscow), no. 3, March 1996. Cauliez, Armand-Jean, Jean Renoir , Paris, 1962. Chardère, Bernard, Jean Renoir , Lyons, 1962. Analyses des films de Jean Renoir , Paris, 1966. Bennett, Susan, Study Unit 8: Jean Renoir , London, 1967. Leprohon, Pierre, Jean Renoir , New York, 1971. Braudy, Leo, Jean Renoir: The World of His Films , New York, 1972. Daniel, Joseph, Guerre et cinéma: Grandes illusions et petits soldats 1895–1971 , Paris, 1972. Predal, René, editor, La Société français (1914–45) , Paris, 1972. Bazin, André, Jean Renoir , edited by Francois Truffaut, Paris, 1973; updated edition, 1992. Durgnat, Raymond, Jean Renoir , Berkeley, 1974. Renoir, Jean, My Life and Films , New York, 1974. DeNitto, Dennis, and William Herman, Film and the Critical Eye , New York, 1975. Giannetti, Louis D., Godard and Others: Essays on Film Form , Rutherford, New Jersey, 1975. Truffaut, Francois, Les Films de ma vie , Paris, 1975; as The Films in My Life , New York, 1978. Faulkner, Christopher, Jean Renoir: A Guide to References and Resources , Boston, 1979. Sesonske, Alexander, Jean Renoir: The French Films 1924–1939 , Cambridge, Massachusetts, 1980. Gauteur, Claude, Jean Renoir: Oeuvres de cinéma inédites , Paris, 1981. McBride, Joseph, editor, Filmmakers on Filmmaking 2 , Los Angeles, 1983. Serceau, Daniel, Jean Renoir , Paris, 1985. Bertin, Celia, Jean Renoir , Paris, 1986. Faulkner, Christopher, The Social Cinema of Jean Renoir , Princeton, 1986. Vincendeau, Ginette, and Keith Reader, La Vie est à nous: French Cinema of the Popular Front 1935–1938 , London, 1986. Viry-Babel, Roger, Jean Renoir: Le Jeu et la règle , Paris, 1986. Brunelin, André, Gabin , Paris, 1987. Renoir, Jean, Renoir on Renoir , New York, translated by Carol Volk, 1990. Bergan, Ronald, Jean Renoir: Projections of Paradise , New York, 1994. Schneider, Bruno F., Renoir , New York, 1995. Renoir, Jean, An Interview: Jean Renoir , with Nicholas Frangakis, Los Angeles, 1998. Fainsilber, Benjamin, "Jean Renoir fait son examen de conscience," in Cinémonde (Paris), 20 May 1937. Bianco e Nero (Rome), September 1937. New York Times , 13 September 1938. Variety (New York), 14 September 1938. Hochheimer, Rita, editor, "A Guide to the Discussion and Appreciation of the French Photoplay Grand Illusion ," in Photoplay Studies (New York), no. 1, 1939. "Renoir Issue" of Cahiers du Cinéma (Paris), January 1952. Hift, Fred, "American Commentary: Says M. Renoir," in Today's Cinema (London), 9 August 1956. "Renoir Issue" of Cahiers du Cinéma (Paris), Christmas 1957. "Un Film— La Grande Illusion —restauré comme un tableau," in Lettres Française (Paris), 6 March 1958. Beylie, Claude, "Ou est la liberté?," in Cahiers du Cinéma (Paris), November 1958. Beylie, Claude, in Cinéma (Paris), November 1958. Sadoul, Georges, "The Renaissance of the French Cinema—Feyder, Renoir, Duvivier, Carné," in Film: An Anthology , edited by Daniel Talbot, New York, 1959. Dyer, Peter John, "Renoir and Realism," in Sight and Sound (London), Summer 1960. Brunelin, André, "Jacques Becker; ou, La Trace de l'homme," in Cinéma (Paris), July 1960. Whitehall, Richard, "The Screen in His Canvas," in Films and Filming (London), July 1960. Kauffmann, Stanley, "The Elusive Corporal and Grand Illusion ," in A World on Film , New York, 1966. Beylie, Claude, in Cinéma (Paris), November 1969. Winsten, Archer, " Grand Illusion ," in American Film Criticism , edited by Stanley Kauffmann, New York, 1972. Diehl, Digby, "Directors Go to Their Movies: Jean Renoir," in Action (Los Angeles), May-June 1972. Kauffmann, Stanley, in Horizon (Los Angeles), Summer 1972. Fofi, Goffredo, "The Cinema of the Popular Front in France (1934–38)," in Screen (London), Winter 1972–73. Sesonske, Alexander, in Georgia Review (Athens), Spring 1975. Gauteur, Claude, "Jean Renoir de Nana à La Grande Illusion ," in Image et Son (Paris), May 1975. Viry-Babel, Roger, in Cahiers de la Cinémathèque (Perpignan), Spring 1976. Perebinossoff, P. R., "Theatricals in Jean Renoir's Rules of the Game and Grand Illusion ," in Literature/Film Quarterly (Salisbury, Maryland), Winter 1977. Strebel, Elizabeth Grottle, "Jean Renoir and the Popular Front," in Feature Films as History , edited by K. R. M. Short, London, 1981. Toles, G., "Being Well-Lost in Film," in Raritan (New Brunswick, New Jersey), no. 2, 1993. Masson, Alain, in Positif (Paris), no. 395, January 1994. Lelouch, C., "A nagy abrand," in Filmvilag (Budapest), vol 37, no. 10, 1994. Lelouch, C., "La grande illusion," in Cahiers du Cinéma (Paris), no. 482, July/August 1994. Casas, Q., J. E. Monterde, and S. Zunzunegui, in Nosferatu (San Sebastian), no. 17/18, March 1995. Special Issue of Archives: Institut Jean Vigo (Perpignan), no. 70, February 1997. The critical estimate of La grande illusion has fluctuated with the vicissitudes of critical theory. In the days when film's importance was attributed to the importance of its subject, it was widely regarded as Renoir's masterpiece, a noble humanist antiwar statement. With the development of the auteur theory in the late 1950s, its reputation dwindled. It came to be perceived as a less personal, less intimate and less complex work than La règle du jeu , which superseded it as marking the summit of Renoir's achievement. Though opposed, these views are based on the same misconception. La grande illusion is much too complex to be reduced to a thesis film, and although an antiwar statement can certainly be read from it (Renoir's detestation of war is not in doubt), that is incidental rather than essential to the film's meaning. In fact, it has a great deal in common with La règle du jeu : Renoir's own account of the thematic premise of the later film applies equally to the earlier ("My preoccupation is with the meeting; how to belong, how to meet"); both have similar four-part structures, moving to a big climactic scene at the end of part two, placing the major climax at the end of part three, with a quieter, more intimate fourth part in which the action moves out of doors or into the countryside. "How to belong, how to meet"—another way of putting it is to say that Renoir's perennial concern is with the boundaries; that keep people apart and the possibility of transcending them. The four-part structure enables him to develop this theme through a network of shifting, interlocking relationships presented consistently in terms of difference and the overcoming of difference. The first part consists of a prologue that introduces three of the four main characters and two of the main boundaries, class and nationality. 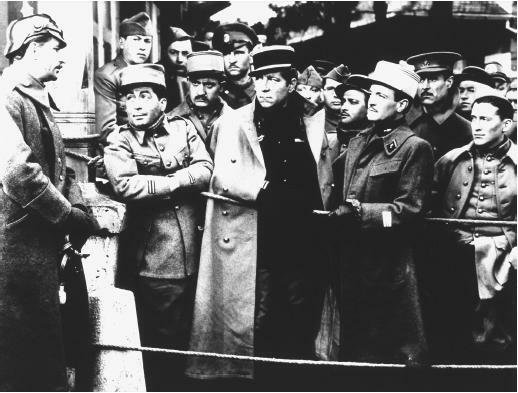 Bœildieu and Maréchal are connected because both are French and involved in a war against Germany; Bœildieu and von Rauffenstein are connected because both are aristocrats and share a particular code that excludes the proletariat Maréchal. The film's basic assumption—that "difference" is socially constructed but so thoroughly internalized and so strongly institutionalized as to be very difficult to overcome—is dramatized in the parallels between the two headquarters (French/German) which are identical in structure but different in every detail, the details insisting upon "Frenchness" and "German-ness" respectively. The second part occurs in the Prison Camp. Another main character, Rosenthal, is introduced, along with a host of minor ones who illustrate diverse aspects of the theme in the particularities of social position, profession, outlook, etc. With Rosenthal a third main boundary is established, that of race and religion. The pattern of alignments/separation becomes more complex: Maréchal/Bœildieu are linked by race and religion (Aryan, Christian) but separated by class position; Bœildieu/Rosenthal are linked by privilege but separated by class tradition (aristocrat/ nouveau riche ); Rosenthal/Maréchal are linked as non-aristocratic but separated by race/religion and social status. This section of the film makes frequent and expressive use of a favorite Renoir motif, the window, which stresses separation (outside/inside), but is also a boundary that can be crossed or communicated across. The second part culminates in the first big climax, the celebrated scene of the prisoners' camp show and defiant singing of the "Marseillaise." Most important here, however, is the film's raising of the last main issue of boundary, that of gender/sexuality, especially in the extraordinary moment when the young prisoner is seen in women's clothes (for the show) and all activity and conversation abruptly cease. Its intensity exceeds anything explainable in terms of nostalgia for absent women: the androgynous figure becomes the center of the men's fascination and attraction. The third section reintroduces von Rauffenstein (now with broken vertebrae, in a sense as much a prisoner as the men he is in charge of) and the development and culmination of the Bœildieu/von Rauffenstein alignment/separation. A leading concern here again connects the film to Règle du jeu : the notion that the aristocratic order the two men represent will not survive the war. The aristocracy of Règle du jeu is significantly different; they no longer are informed and guided by a clearly defined code of nobility. Règle du jeu 's Marquis is connected, not to Bœildieu, but to Rosenthal (not only are the two characters played by the same actor, but we are told that "Rosenthal" was the name of the Marquis's grandfather). Renoir views this inevitable destruction of a way of life with marked ambivalence. The aristocratic code is seen at once as based upon an untenable privilege and as embodying a fineness without which civilization will be poorer. This part of the film moves to the second major climax, in which Renoir magnificently ties all the major thematic and dramatic threads together: the escape of Maréchal and Rosenthal, secured by Bœildieu who sacrifices his life by compelling von Rauffenstein to shoot him. The scene echoes the climax of the second section by centering on a "theatrical" performance (Bœildieu playing his penny whistle on the battlements, the searchlights trained on him as "star"). Together with the ensuing scene of Bœildieu's death and his class friend/national enemy's grief, the scene enacts the theme of the end of the aristocratic order (the proletarian Maréchal and the nouveau riche Rosenthal are the embryonic future). It achieves the film's supreme irony in its play on the intimate understanding and affection between two men, one of whom must kill the other. The last section involves the escape/the farm/the border. The relation of La grande illusion to classical narrative (with its traditional pattern of order-disturbance of order-restoration of order) is complex and idiosyncratic. The narrative actually takes place in the hiatus between two orders: the order the war has destroyed and the new order that will be built when it is over. Between the two, Renoir manages at once to suggest the social order that was left behind and the possibility of a different order no longer based on artificial divisions. In the camps, the boundaries of class, race, and nationality are repeatedly crossed and eroded as new alignments (based on human need and sympathy) are formed. The last section restores what was crucially absent earlier: the presence of a woman. A series of three immediately consecutive scenes can be read as "answering" and containing the eruption of possible bisexuality in part two: Maréchal and Rosenthal sleep in each other's arms (the motive is warmth, not sexuality, but nonetheless they are in close bodily proximity); awakening, they quarrel violently, Maréchal calls Rosenthal a "dirty Jew," they separate, then tentatively come together again; hiding in a barn, they hear someone coming and spring to either side of the door; the door opens and, exactly between them, the woman appears. The ensuing scenes restore the heterosexuality that, at the outset, was present only as a song ("Frou-Frou") and a memory (Maréchal's Joséphine, the woman recalled by both Bœildieu and von Rauffenstein). This leads to the ultimate expression of togetherness/division: the Christmas celebration in which Rosenthal assists, only to be excluded as the lovers leave to go to bed. If the film celebrates the possibility of demolishing boundaries, it also acknowledges, within the existing social system, their inevitability.